Презентация на тему: "To Be Healthy is To Be Happy. ARE YOU FOND OF SPORTS? 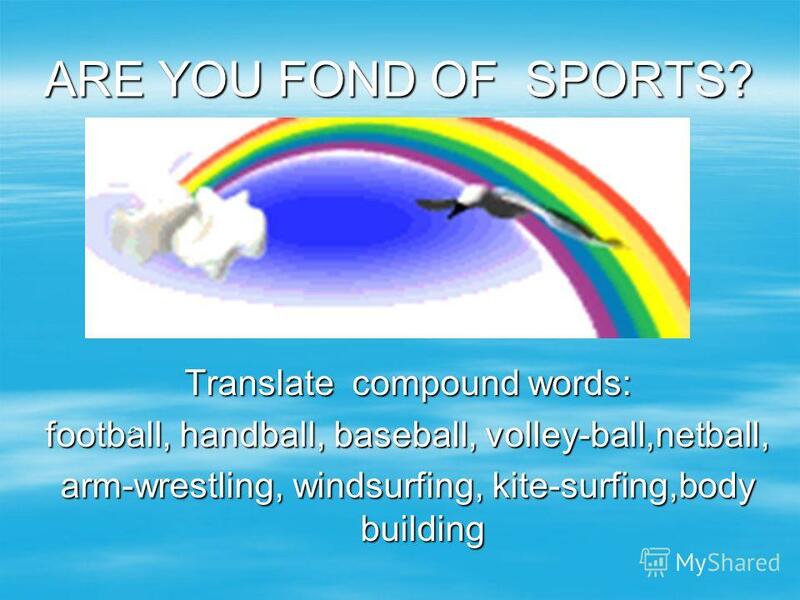 Translate compound words: football, handball, baseball, volley-ball,netball, arm-wrestling, windsurfing,". Скачать бесплатно и без регистрации. What is useful for us? Presentation was made by the pupil 7B Yurova Yuliya. Our Healthy Life.. 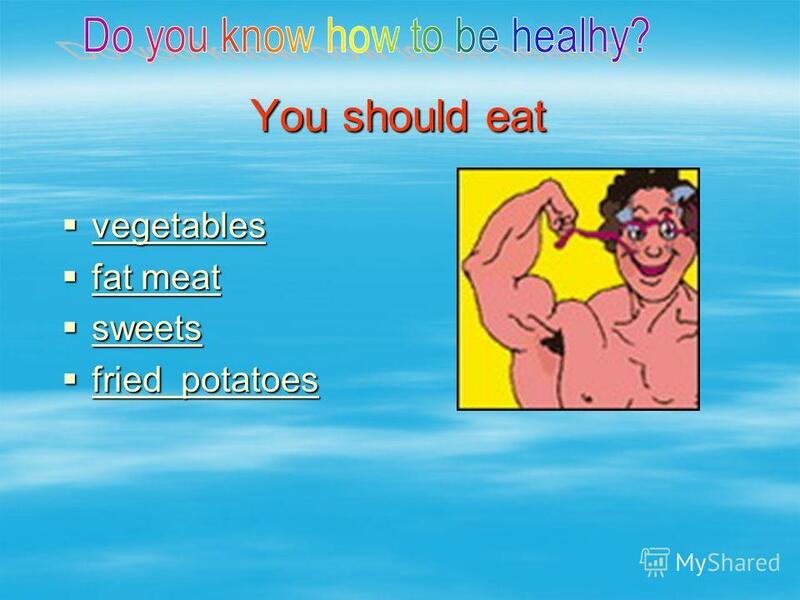 It is very important to be healthy and fit. 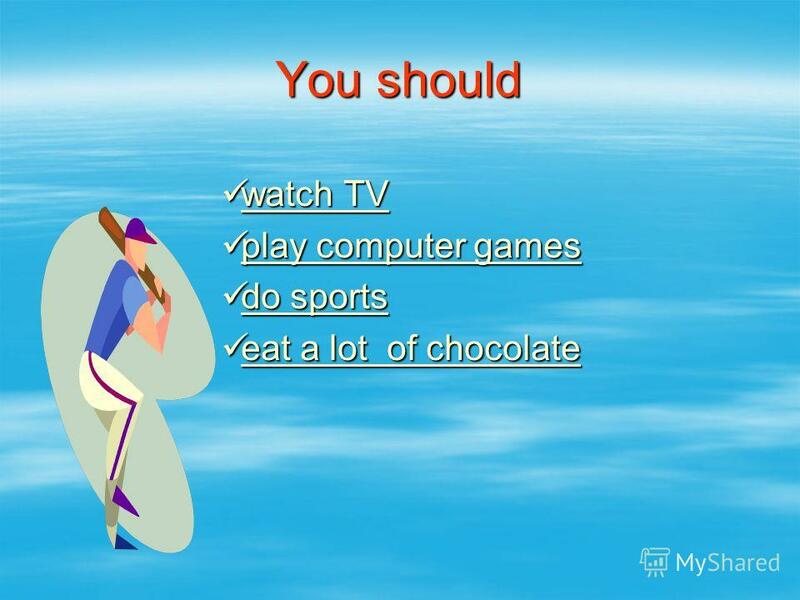 I think I am a healthy kid, because I often play sports. But Im sure I should eat healthy. Bread cheese fish sugar butter milk cake water. Food for health. - Do you usually have breakfast in the morning? - Do you like juice for breakfast? - Do you like milk for lunch? - Does your mother drink. W hat do you do to keep fit?This question asked many people.For it dont need a lot of effort! To lead a healthy life, you must: 1. Eat more fruits and vegetables. Keeping Fit Or what is necessary for keeping fit. Work performed Kruglova Oksana 6 "A" class.. Healthy Child. 1. Don't watch TV mush. 2.Don't play the computer games mush. 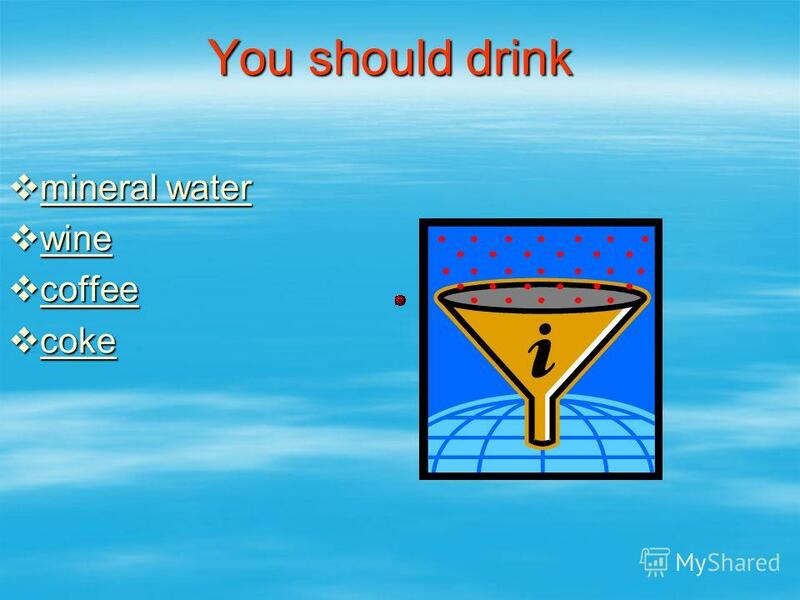 3.Drink milk for breakfast. Project Does Your Health Depend on You? Teacher Pletneva L. F. Students Volkova L. and Shtankova M. Visokoe school 2009. 11 th grade V School 67. A lot of people like drinking coca-cola and coffee, enjoy pizza and hamburgers. But what is tasty is not always healthy. Healthy Living Guide GOOD AND BAD HABITS Учитель МОУ СОШ 13 ст.Новоджерелиевской Урадовская Татьяна Николаевна. An apple а day keeps the doctor away. People get vitamins from the food they eat. There are a lot of vitamins in fruit and vegetables. But you can hardly. Our Health is Our Wealth. Healthy food Giving bad habits up Keeping Fit. 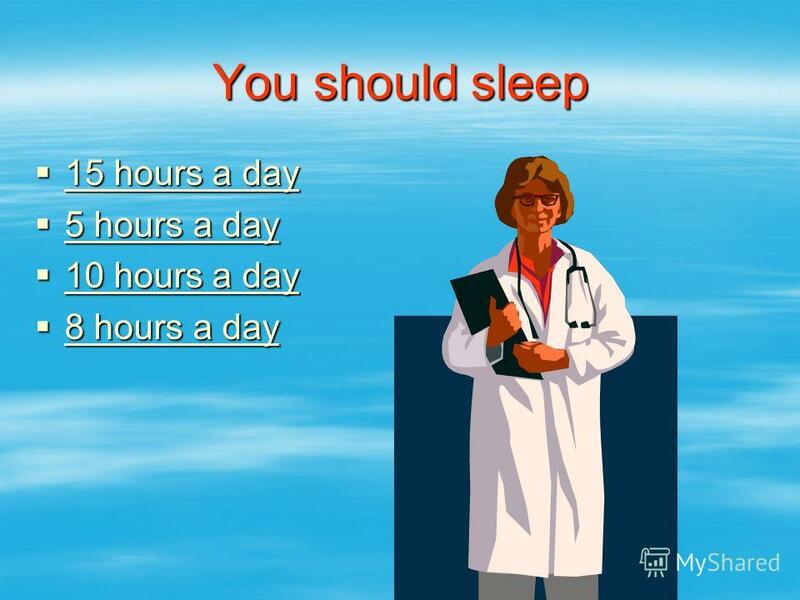 Do you want to be healthy?. The first wealth is health. I think many people can agree with this famous saying. But they dont do their utmost for keeping.